The perfect gift or award for any special occasion. Western artist Terrance Patterson has designed these surveyor statues exclusively for POB. Each 13" statue is carefully handcrafted in the artist's studio and then bronze-coated for a beautiful finish. 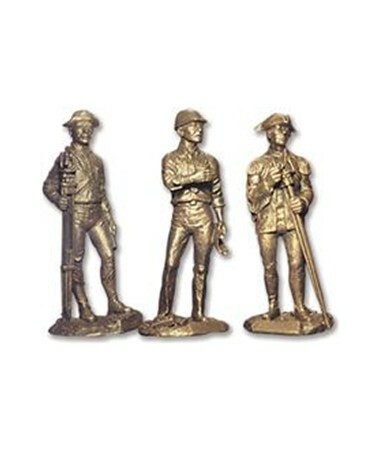 A free brass engraving plate is included with each statue for future engraving. The Early Western Surveyor (left), our most popular statue, captures the feeling of the rugged individualism that early Western surveyors represented. It features a pioneering surveyor complete with his transit and tripod. The Construction Surveyor (center), our most modern statue, portrays a typical surveyor on a construction site. It features a modern-day surveyor complete with hard hat and blueprint drawing. The Colonial Surveyor (right) is designed to show the spirit of our nation's first surveyors. It features an Early American surveyor complete with compass and chain.